From the electrically commanded gates of the property there are 48 steps up through owners’ side terrace, to the rear terrace of La Vigna apartment. 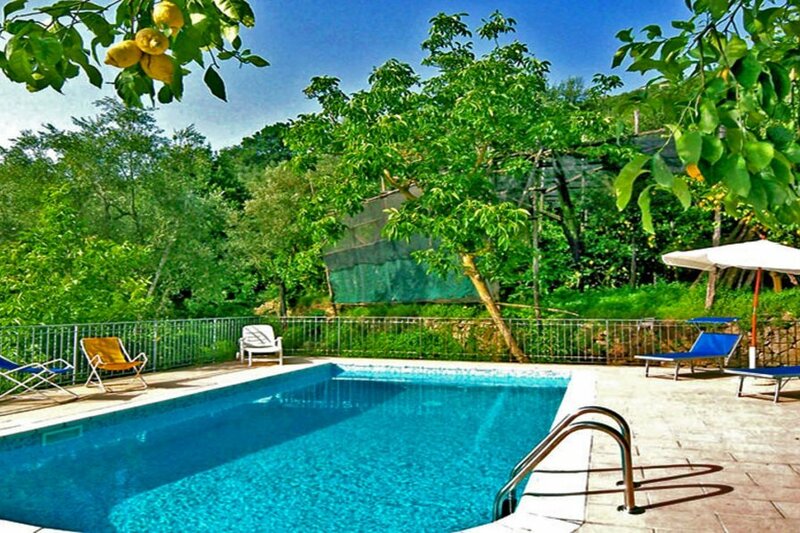 The other two holiday apartments that comprise the villa are - Gioia - Il Sorriso. 2 Single beds, Heating, Access to Front Balcony. Divan Bed, TV, Access to Front and Side Balconies, 4 Gas Rings, Oven, Fridge - Freezer, Kettle, Toaster. The property lies approx. 250 meters from the large Piazza S. Francesco and is accessed through a very narrow lane. Large cars parking is on the Piazza and luggage porterage is included both on arrival and departure. Notice : For those who choose to park in the Piazza S. Francesco parking is free of charge but not private and on Friday morning there is a street market when vehicles have to be parked a little further away. This property is available for a minimum stay of seven nights. Services - Beach: 10 Km. (Marina del Cantone) 3,5 Km. (Marina della Lobra) - Restaurants 200 m. - Mini market 1 Km. - Bus Stop 900 m. - Motorway 33 Km. Cites - S. Agata sui 2 Golfi: 5 Km. - Massa Lubrense: 2 Km. - Sorrento: 8 Km. - Napoli: 57 Km. - Positano: 21 Km. - Amalfi: 36 Km. - Ravello: 43 Km. - Roma: 274 Km. Attractions - Pompei Excavations: 34 Km. - Vesuvius Crater: 56 Km. - Amalfi Coast: 12 Km. - Paestum Excavations: 109 Km. - Capri Island: connected from the port of Sorrento 9 Km. Airports - Naples Capodichino - 60 Km. - Roma Leonardo da Vinci 289 Km. - Roma Ciampino 263 Km. - Bari 299 Km. Railway Stations - Napoli Centrale 57 Km. - Sorrento 8 Km. Check-in time is between 3,00 and 8,00 p.m. You will be met and taken to the booked accommodation, asked for a photo copy of your Id or passport, any extras and the Breakage deposit (in cash only in any currencies) € 300,00 – this is refunded on your departure day, less any breakages. Short stays supplement: Mandatory, € 50,00 (from three to six nights) payable locally in cash. Household linen and consumes: Mandatory, € 70,00, payable locally in cash. Heating: On request, supplement is € 12,00 per day (6 hours), payable locally. Cot and Highchair: On request, € 55,00 at weekly supplement, payable locally in cash. Those who have difficulty in walking, please ensure to read access to property. Rental tariff is based on a minimum stay of Seven Nights. For Shorter stay please make a specific request. After the bustle and noise of the tourist centre along this coast, the position of La Vigna apartment is quiet and peaceful. The nearest bus stop to Massa Lubrense and Sorrento is 900 m.
The larger, and well-known town of Sorrento is about 8 Km. from the apartment, and from here there are ferry boats and hydrofoils to Naples, Capri, Ischia, Amalfi and Positano, as well as go on mini-cruises. The nearest railway station (Circumvesuviana line to Pompeii, Naples) is also in Sorrento. The nearest beach is Marina della Lobra (5 Km.). Positano is about 16 Km. away from the property. The distance to Naples is 60 Km. A car is recommended if you are staying at La Vigna. The easy way to get to La Vigna (San Francesco / Massa Lubrense) from Naples/Rome Airport or Naples Train station is to rent a car. Once at the property you can also get around with public transport as parking in some towns is hard to come by and expensive. Public Buses operate year-around connecting Massa Lubrense -Marine del Cantone - Sant´Agata and Sorrento. The main bus terminal is Sorrento for buses to all the Amalfi Coast villages. Ferries from Sorrento (from May to October) operate a service between Amalfi - Positano - Capri Island - Naples.